Buy Mo Mo O'Brien a Coffee. ko-fi.com/momoobrien - Ko-fi ❤️ Where creators get paid by fans, with a 'Buy Me a Coffee' button. Mo Mo makes youtube videos about everyday adventures YOU can go on! 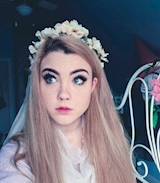 How to become a Mermaid, go to Hogwarts, and live in Downton Abbey are a few of her videos.br/ She has lots more adventures she's been invited to attend FOR FREE, but not enough personal finances to get her there. Plane tickets are expensive. Please consider supporting her, to help cover expenses that go into making her videos. Secured Payments. Support goes to Mo Mo O'Brien's account. Upgrade Mo Mo O'Brien to a yearly Gold Membership with a one-time payment.